Find our 4 Slice Toaster reviews, comparison charts and buying guides to help you buy the best 4 Slice Toaster for the perfect morning breakfast. KitchenAid KMT4203: Need an absolute best toaster for your home or small cafe? The KitchenAid KMT 4203 is our top recommendation for 2019. It comes with multiple toasting options like Bagel, Defrost etc. while the keep warm toaster ensures you’re never serving cold toast to your customers. Cuisinart CPT-180BKS: On a tight budget? The Cuisinart CPT-180 CH is our top recommended budget pick. It comes with all basic functionalities like dual controls, multiple toasting modes and LED indicators so you never have a bad toast day. For a toaster that costs under $100, it’s a steal. Is there anything more enticing than the smell of perfectly done toast first thing in the morning? Whether you’re having a lovely, luxurious breakfast in bed, or a quick bite to eat before running out the door on the way to work, it’s a convenient and tasty way to start your day. With so many different options out there for toasters such as toaster ovens, 2 slice toasters etc. making the right choice can be difficult. There’s no need to feel overwhelmed. This guide will give you the lowdown on all the information you need to make a well-informed decision. From the product features, aesthetics, budget to even how it might work in your kitchen, we’ve got you covered. The incredible KitchenAid Candy Apple Red 4-Slice Pro Line Toaster is a foodie’s dream toaster. The bread is automatically lifted and lowered into the toaster, toasted until it is the perfect shade of brown – not too soft and not too crunchy – and then pops up with a chime so that you can get to it when it is ready. No worries if it takes you an extra minute to get back to the kitchen – your toast won’t be cold. Your fabulous new toaster automatically keeps it warm for you! The options are easy to navigate – simply choose ‘bagel’, ‘frozen’, or ‘toast’ and decide whether you want it lightly toasted or dark – there are seven options to choose from. It will work equally well in a minimalist, contemporary home or a busy household trying to get a big family ready for their day with a nutritious breakfast. No need to worry about fishing crumbs from the bottom, it couldn’t be easier with this toaster’s flawless design features. With a beautiful red exterior, this toaster will add some warmth to your kitchen. It is sleek and modern in style and would fit with a wide variety of interior design choices. In tandem with your other kitchen choices, this toaster will give visitors the impression that you’re style shows through in all things. Yes, it comes with a luxury price tag but it’s only a reflection of the refined quality of the product, which has been manufactured to extremely high standards and is likely to last for many happy years. Although the KitchenAid Candy Apple Red 4-Slice Pro Line Toaster may seem steep for some, it could be considered as a thoughtful wedding or housewarming gift for friends or family. This is the ultimate toast-lovers toaster. If you’re on the lookout for a high-end option that will look fabulous in your kitchen and give you amazing, delicious toast every single time, this is for you. Line Toaster is our top choice because it’s quite simply the best on the market, so if you’re looking for a luxury option, this one is for you. The Dualit 4 Slice NewGen Toaster Copper is one of the most widely respected brands on the market. It toasts your bread quickly and evenly every single time. What’s more – once your toast is done, it keeps it warm automatically for you – so you’ll never have to face a cold or soggy slice of toast ever again. With an abundance of space, this toaster can be used for sliced bread, bagels, pastries, pita bread and more. This intuitive appliance will toast your bread or bagels perfectly without drying them out – so your breakfast bite or snack will have just the right amount of crunch! 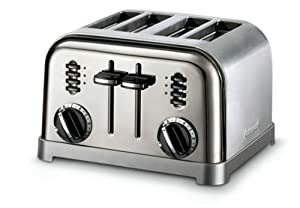 The beauty of this piece is the quality of the parts, it’s been manufactured with only the best equipment and parts – the heating element is of a superior standard to many of the more inexpensive brands, and this is what sets it apart in making consistently perfect and tasty toast. Dualit combines simplicity and sophistication perfectly. It features extra wide 28mm slots to accommodate a Sandwich Cage and the award winning ProHeat elements (a patented design that increases element longevity). The toaster also features a removable crumb tray and an adjustable rear foot. The warming rack is exceptionally useful for warming items up without having to put them into the toaster itself. This artfully designed toaster is available in a wide variety of attractive colors to suit any kitchen interior and is designed in a simple and elegant style. It’s compact so it won’t take up too much space on your countertop, and the dials are easy to read and navigate. It will fit in perfectly with a wide variety of interiors and add a sleek modern feel to your kitchen. The Dualit 4 Slice NewGen Toaster is another deluxe option for families who don’t mind paying a little extra for top of the range items. It was designed with an exceptional experience in mind and engineered to last. For those who wish to make an investment in a machine that will produce top quality toast every time without fail, it’s an excellent choice that will be worth every penny. This toaster will suit those with an appreciation for finely tuned machines. Composed of high-quality parts and designed to fit in with a unique interior design, this toaster will create beautiful snacks and complement beautiful homes. The Dualit 4 Slice NewGen Toaster is a purchase that could be considered a wise investment for families who love toasted bread, bagels, pitas or even pop tarts! This economical choice of bread toaster has dual control panels that really make it two toasters in one – choose one setting for you and another for your partner or kids. It makes evenly browned toast every time, and can be used for pop tarts, frozen waffles as well as to toast bread. You also get custom controls including 6-setting dials to choose how you would like your toast browned including an ‘a bit more’ option if your toast isn’t quite done. Other functions include a dual reheat option, defrost and bagel buttons with LED indicators. There are 1.5-inch wide toasting slots so there’s plenty of room in there for bagels, an extra-lift carriage lever, and a slide-out crumb tray to make it easy to clean. A boldly designed chrome toaster with chunky black dials and a modern build, this toaster gives your kitchen a funky and fresh feel. The stainless steel chrome exterior means that all it takes is a quick wipe for your toaster to appear shiny and brand new. It’s a small but sturdy appliance that fits in with a wide variety of different interior design styles. The Cuisinart Metal Classic 4-slice toaster is an exceptional choice for those who want to combine high quality with a reasonable budget. For toaster costing less than $150, this is an ideal choice for families who want to make a reliable choice without breaking the bank. Rather than choosing a cheaper option that is likely to break or let you down, choose a frugal option that offers the reassurance of a high-quality piece. With a three-year limited warranty, the price tag becomes even more attractive, as you don’t need to worry about faults. The Cuisinart Metal Classic 4-Slice Toaster is a sensible and affordable option for families, available at a price that can’t be argued with. It’s a visually impactful appliance with useful features that you can rely on a day to day basis. Choose this option if you want a fantastic appliance but your number one concern is getting the best possible value for money. 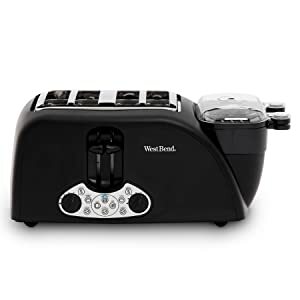 This superb machine has extra-wide slots for all your bread and bagel toasting needs, with dials to choose the perfect shade of toastiness as well as options for defrosting and reheating. The handy digital display and countdown timer make it easier than ever time your breakfast perfectly, with even and reliably toasted bread each and every time. 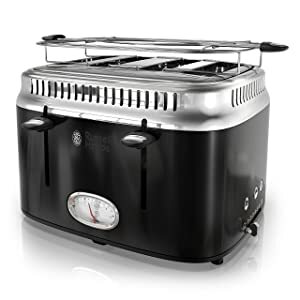 It toasts your bread and bagels evenly, leaving it crunchy on the outside and soft on the inside, exactly how you like it. Your toast doesn’t pop up automatically, it stays safe in the toaster to keep it warm until you hit the lever to pull it up. And even if you’re in the next room, the charming chime will let you know the moment your toast is ready to be served. For those who loved the top KitchenAid choice that came in at number one on this list but didn’t love the price tag attached, this is another option from the same brand with the much more affordable price tag of $159.99. A fantastic blend of quality and price, this is a great choice for families who want to make wise and prudent long-term choices with their kitchen appliances. This super nifty looking toaster has contrasting red and chrome tones that give it a slightly retro feel, and it comes with a digital display and a countdown timer that gives this simple appliance a futuristic feel. It’s larger than an average toaster and designed with easy-use buttons and dials. The toaster will be the envy of your neighbors when it takes pride of place on your worktop. The cord can be stored conveniently underneath the base so there are no messy wires sticking out when you need to store it – how clever is that little feature? The KitchenAid KMT422ER 4-Slice Toaster is a phenomenal choice that makes an exquisite addition to any kitchen. It’s a great choice for those who are enthralled with the KitchenAid brand, want a mid-range toaster and have a keen eye for a modern design. This functional toaster has a long slot capacity that means it can be used for any shaped bread or pastry. It comes equipped with an LED light that indicates the progress of your toast. A ‘toast ready’ sound alert can be adjusted to high, low, or mute depending on what suits your needs best. The long slot enables users to toast four slices at once but it can also toast long rolls but that’s not the only advantage of the long slots. These long slots also provide the toaster with a compact design which means it can be easily be tucked against the wall. The 1600 Watt element features a cool touch brushed die-cast metal body. The toast surface is uniformly toasted without the dark and light spots that you can sometimes find from an ordinary toaster. There is a convenient slide-out crumb tray and concealed cord storage, to easily keep your kitchen clean and tidy. Sleek, small, and minimalist in style, this perfectly apportioned toaster was designed with those of us who have compact kitchens in mind. Created for apartment dwellers who don’t want the hassle of putting a toaster away in a cupboard after every single use. This machine takes up a small amount of space on your counter, saving you time every day because it doesn’t need to be stored away. The silver color blends well with a wide variety of other appliances and is easy to keep clean and shining. With the undeniable strength of the Breville brand behind it, the Breville Die-Cast 4-Slice Long Slot Smart Toaster priced around $170 and thus is upper to a mid-range toaster that can cater to a wide variety of budgets. Its price is an accurate reflection of the craftsmanship of the product, which elegantly combines the highest quality of parts with a simple, chrome exterior. The Breville Die-Cast 4-Slice Long Slot Smart Toaster is the ultimate choice for toast lovers who are looking for a balance between an upper mid-range price tag and a highly functional appliance. It’s an impeccably crafted device. Simply put, it makes great toast and it looks great in your kitchen. This eye-catching fire engine red toaster has a toasting timer that shows the time it will take to make the toast at the selected browning setting. It has a removable warming rack that attaches to the top of the toaster, allowing for an easy warming of buns, pastries, and rolls that can be removed for normal toasting. The Lift & Look feature means that you can monitor the progress of toasting without canceling the heating cycle, and with variable browning control, it’s easy to select the level of doneness you prefer, from 1 (light) to 6 (dark). While with the Bagel function, the toaster cuts the sides and warms the bottom side of bagels. The Frozen setting adjusts toasting to achieve results identical to fresh bread. This is one of the most visually impactful toasters featured in this post – it’s designed to stand out and bound to attract compliments. The color is bold and the style is somewhat vintage; it’s an appliance that won’t just sit on your countertop, it will become a focal point in your kitchen. This 4 slice toaster truly is a steal. It’s an unbeatable price for such a well-known and widely respected household brand. It’s a toaster with a difference and is an exceptional choice for families who may be on a tight budget but don’t want to compromise on substance and style. This toaster would make a wonderful “moving in” gift for couples on your friend circle or family. This is more than just a toaster – with four wide clots suitable for muffins or bread to get your carbs in, this nifty little machine also has two warning trays suitable for cooking meat and eggs. A bacon and egg bap can be ready in less than ten minutes with these amazing features – and the clean up afterward is easy too. Eggs can be poached, hard boiled or soft boiled depending on your preference. The appliance is black with contemporary design attributes including silver buttons. The dials are easy to use and simple to understand. It’s easy to clean and will blend easily with many different styles of kitchen. This super neat egg and muffin toaster will cost you less than $100 making it an extremely affordable option for families, professionals and students alike. Given its multifunctional options and ease of use, it would be difficult to find a similar quality product for a better price. The West Bend Egg and Muffin Toaster’s simple enough that even older children can use it, and it makes a filling and nutritious breakfast in no time! It’s extremely good value for money, and it doesn’t just toast bread – it makes your whole breakfast with one handy little appliance. This kitchen essential is going to form a big part of your morning routine. It’s one of those things you’re likely to use almost every single day ensure you make the right decision. These five options listed above offer a wide variety of choices for a broad range of needs and you’ve no doubt found the right option for your family to purchase. Don’t risk burnt toast, hungry kids, and cranky mornings when all that hassle could be saved by making a wise investment now. Choose a toaster that will delight you from the first delicious buttered slice and continue to make your family happy at breakfast time for years to come. All of the toasters we have mentioned here have different and unique benefits going for them. It’s up to you to decide now which one is best suited to your family, your lifestyle and your needs. A four slice toaster can speed up the time it takes to get breakfast done in the morning and make sure you start your day right. Make the right choice today! You’re now totally well informed and ready to buy the toaster that will perfectly complement your kitchen. After careful review and consideration, we have selected these as the best range of four sliced toaster models to choose from for 2019. In making your choice, don’t forget to consider your budget, the quality of the product, how it will look and fit into your kitchen, and of course, how delicious that first slice of toast will taste when you bite into it! If you’re in the market for a premium 4 slice toaster the KitchenAid KMT4203 is just what you’re looking for. With its top of the line features, we’d call it the professional’s choice 4 slice toaster. Got budget Constraints? While the Cuisinart CPT-180BKS doesn’t come with the fancy frills on a high-end model, it’s got all the basic features you’d want in a toaster.